In 1997 my uncle Brian died, prey to America’s inaction in the face of the AIDS crisis in the '80s. A heterosexual male with a wife and two kids, he was infected by an unscreened blood transfusion after the Reagan administration and the rest of Puritan-reflux, cis-het America saw fit to judge and crack jokes for the better part of a decade rather than getting a jump start on the treatment and prevention that could have saved his and many others' lives. I mention Uncle Brian’s passing as we approach World AIDS Day, Dec 1st, because America's inaction in the face of that burgeoning crisis—inaction that led to his and many others' untimely deaths—bears a disturbing resemblance to a new inaction, one that has already led to at least 100,000 unnecessary deaths in American cities. In the mid-90s, when America was just starting to admit that HIV/AIDS was a real crisis and scrambling to scale treatment and prevention nationally, a gun violence epidemic was taking root in the nation’s urban centers. Like AIDS, it affected mostly men, and, in particular, young black men in densely populated, hyper-segregated, economically poor neighborhoods. As with the outbreak of AIDS, the pearl-clutching public responded not with sympathy or a redoubled emphasis on public health, but rather by hyperventilating, judging, and fear-mongering, using terms such as "superpredator," "thug," and "gangbanger." Though the proximate causes of the two epidemics bear little comparison, it is in the cruel, vicious pubic response—given that both were later found to be completely preventable epidemics—wherein the analogy, and hopefully solidarity, lie. From the time AIDS first appeared in a medical journal in 1981, to the time Ronald Reagan first uttered the word in public, approximately 21,000 people had died. In all, roughly a million people lost their lives before the public came around and treatment and funding finally scaled. Similarly, with the epidemic of gun violence, criminologists at Harvard and the University of Chicago learned how to turn it off and prevent it completely—and I mean that literally—in 1996. That year a program later dubbed the "Boston Miracle" ended teen gun deaths in Boston for 29 straight months. A similar thing happened in Chicago, where a like program cut gun violence by as much as 73% in target areas, and cut retaliation shootings by as much as 100% in several trial sites. In Baltimore's McElderry park, traditionally one of the city's most violent hotspots, a similar program was responsible for a period of 22 months without a single gun homicide. With AIDS, the non-LGBTQH public eventually came around, if reluctantly, and today with proper treatment it can be managed—it's no longer a death sentence for those infected. 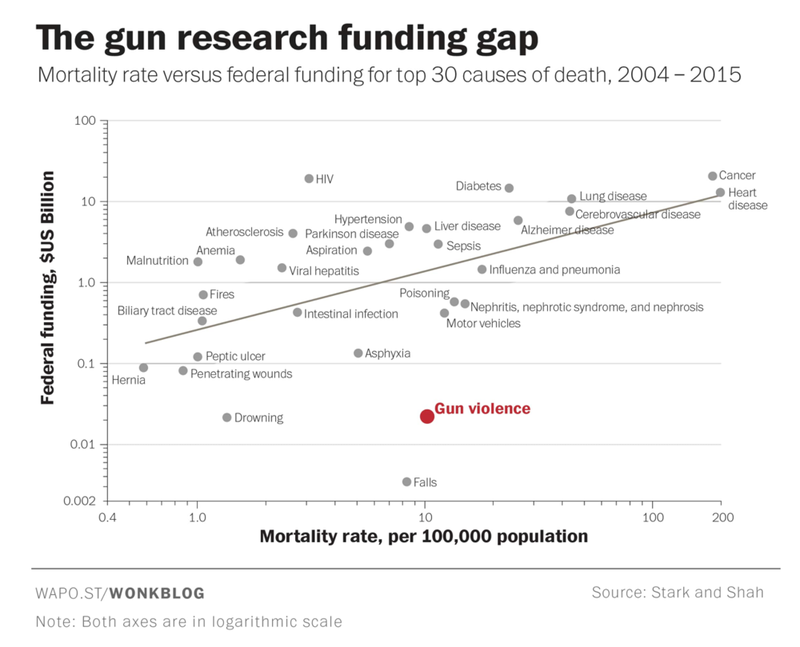 On gun violence, however, despite 20 years of data showing thousands of deaths could be prevented at a fraction of the cost of criminal justice interventions, the public hasn't budged. Jurisdictions with the worst gun violence epidemics in the country underfund, ridicule, and axe the programs proven to save lives, and so far the general public has scarcely noticed. In the table above, from a recent Washington Post article about gun violence, the author didn't even mention that these life-saving programs exist. Boston, which I mention because it was the first city to pilot Operation Ceasefire (the program responsible for the Boston Miracle) abruptly discontinued the program in 2000. Per the chart at right, gang-related youth gun homicides — the kind the program was specifically designed to prevent — sextupled from 5 to 30 in the years directly following. By 2005, overall homicides spiked from a record low 31 to a 10-year high 75. Today, despite data showing that the Boston Police Department is failing to solve 96% of shooting cases, the city spends upwards of $300 million on police salaries and $1 million on program salaries for the streetworker program modeled on Ceasefire. That's a roughly 300:1 ratio of what data shows doesn't work to what data shows does work. Meanwhile 16-year-olds and women sitting on porches continue to get killed, and the city, rather than taking decisive action steps to reverse its completely backwards allocation of public safety funding, has decided to conduct yet another study evaluating a question that it has known the answer to for three decades: yes, these programs work. In Chicago, a city with one of the nation's most highly publicized gun violence crises, the situation is dire. Rather than scaling its highly effective Ceasefire program to all of the city's hotspots, city and state leaders cut funding in 2007, again in 2013, and again in 2015. Today, with homicides at the highest level seen in decades, city officials vehemently claim they have no answers and no money while allocating more than a billion dollars each year to a police department failing to clear more than 80% of murder cases and costing taxpayers hundreds of millions of dollars in misconduct judgments. As in Boston, the chart above right reveals the cost of Chicago's refusal to allocate its public safety resources in line with what the data says: cuts to the program resulted in 816 hundred additional shootings in just 18 months. Not only had the trial sites seen large reductions directly related to the program, but in May 2015, Baltimore’s most violent month in the city's most violent year on record at the time, the Safe Streets site in Cherry Hill reported there hadn’t been a gun homicide in over a year. Another site, Mondawmin, hadn’t had a shooting all month. Same in Park Heights, another site. Meanwhile, in the police-only hotspot areas where Safe Streets was still not operating three years after the Hopkins data, the city saw an 83% increase in shootings, more than three a day, with 29 people shot over the Memorial Day weekend alone. As in Chicago, Baltimore's elected officials claimed then — and continue to claim — there's no money for Safe Streets, which the state recently cut by more than half. Meanwhile the city doles out more than $500 million annually to a police department failing to clear 75% of current year homicides and costing taxpayers millions in misconduct judgments — the cost of which judgments alone would be enough to scale Safe Streets to all of the city's hotspots for multiple years. As World AIDS Day approaches, we should reflect upon what can happen when a nation recognizes it's wrong to stand by and do nothing while people die from an easily treatable epidemic. Baltimore sees around 300 gun homicides per year. Chicago around 800. If we add these gun deaths together since 1996, when effective gun violence prevention programs were discovered, we're talking about roughly 24,000 unnecessary deaths in these two cities alone — a similar number that died of AIDS before Reagan first spoke the word. Nationally, America sees roughly 11,000 gun homicides annually, which means that to date the number of preventable gun homicides in all 50 states is anywhere between 100,000 and 200,000 lives lost. It’s long past time we recognize that if it was wrong to stand by and do nothing during the AIDS epidemic — which everyone today universally agrees that it was — then it's also wrong to stand by and do nothing while young black men continue to lose their lives to a completely preventable gun violence epidemic in our nation's cities.